My trip to Ireland for work is doubling as research for my upcoming novels. I’ve already done some Celtic research of course, such as reading and entire history book on the Celts. So since my main character, Jake, finds out he is a druid, he is of course going to be experience some Celtic history. He doesn’t get much of that in the first book, but in subsequent books, he will slowly familiarize himself with Celtic history. Also, there is a good chance Ireland will be the setting for a least part of one of my future books. So far I have stood on top of the Hill of Tara, walked the grounds of Skryne, and dangled my legs from the Cliffs of Moher. I stepped blindly up and down the wishing steps before entering a druid cave. On the way to see the Poulnabrone dolmen in the Burren, we drove paved roads so thin both sides of the car seems to touch the green vegetation that walled both sides of the road. 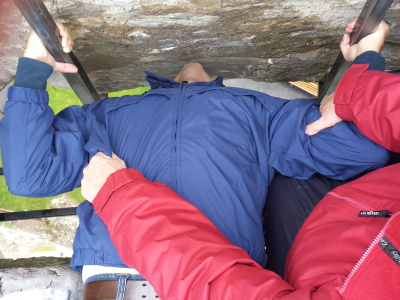 I kissed the Blarney Stone, so if my next books wax more eloquent, you’ll know why. I also encountered a man who wanted to etch my name in Ogham characters on a pendant for 15€. Yeah, I let him do it and I am wearing it now. My brother spent two years on a church mission in Bristol, England, just across the bay from Ireland and he raved about the fish and chips. I have to say, I when I first ordered it, I was not disappointed with the slab of breaded fish placed before me. Hopefully this research leads to some accuracy in the hints of Celtic-ness in my books. Don’t think I won’t still imagine though. I am already imagining a hidden underground below Dublin that is accessible under or near Christ’s Church that only the darker side of the world knows about. Leave a reply on "Researching Celtic and Irish History"